Home » public health » Where Are the Helmets in the Home Run Derby? Where Are the Helmets in the Home Run Derby? Last night I returned home from a lovely dinner with my injury prevention colleagues to a sight that really caught me by surprise. My husband was watching the Major League Baseball (MLB) Home Run Derby. I tuned in for a moment before turning to him and asking, "Why aren't they wearing helmets?" I think we are all accustomed to seeing players in their batting helmets, so this looked strange to me- especially in contrast to the catcher, who was dressed in full protective gear. My husband informed me that helmets are not necessary because the pitches are much slower. However- I would disagree (and this is not the first time I have critiqued professional sports and their commitment to protecting players from head injuries). First of all, concussions (which we must remember are a traumatic brain injury!) do not only occur when the ball is traveling 100 MPH. Therefore, a slower pitch does not equal safety. The catcher still wore full protective gear. The pitcher stood behind protective netting. So on some level it is acknowledged that hazards still exist at the Home Run Derby. In addition, concussions (or more serious injuries) can happen even when you are not the batter. Therefore, helmets protect you when you are on deck, warming up, or coaching from the sidelines. Home Run Derby participants are still at risk for injury when they are not at bat. This is a lesson that many in baseball know far too well. In 2007, a minor league first base coach was killed when he was hit in the head with a line drive. This tragic accident resulted in a change in policy regarding required head protection for first and third base coaches. Speaking of policy, I find it strange that their batting helmet practices vary based on the speed of the pitch. This is not an acceptable strategy in other areas of injury prevention, so why is that the strategy here? We don't tell people to only wear seatbelts if they are planning to drive faster than 40 MPH. We don't tell people to only avoid texting and driving if they are on the highway. The MLB seems to be accepting a high level of risk for their players in this context. This is especially surprising since MLB and the MLB Players Association have taken steps to prioritize safety regarding head injuries. They recently implemented a universal concussion policy (which went into effect on Opening Day 2011). The new policy dictates both how concussions are initially treated and when player/umpires are allowed to return to play. The most substantial change is the creation of a 7-day disabled list to allow players an appropriate amount of time to heal after a concussion. They are also introducing reinforced helmets that can withstand 100 MPH fastballs. While the safety of the players is paramount, this discussion is also important because MLB players are role models. Therefore, it is important that they model acceptance and proper usage of personal protective equipment. If you looked at the stadium crowd at the Derby (and the lucky few invited to catch balls in the outfield), it was mostly kids. If the MLB and the players do not provide leadership on safety policies and equipment, it could have larger public health effects on the audiences that model their behavior (so don't get me started on the chewing tobacco issue). Therefore, I strongly encourage MLB to review their policies regarding personal protective equipment and the grey "safe" areas they have identified, like the Home Run Derby. It appears to be a relaxed, fun event during the all-star break but in reality, they are unnecessarily putting the safety of their players at risk. 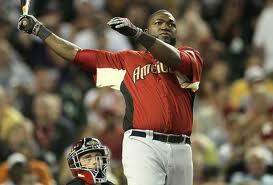 Related Posts : Where Are the Helmets in the Home Run Derby?